October Gonzalez is a popular American TV host and media personality. Additionally, she is also a model. Gonzalez has hosted several TV shows such as Beat Shazam, Entertainment Tonight, and Rachel Ray. She has also featured in several reality TV shows. Gonzalez’s fame is not just due to her profession but also because of her marriage. She is married to former NFL superstar, Tony Gonzalez. Tony Gonzalez is a former NFL player who is widely regarded as the best tight end in the history of the league. He spent a total of 17 years in the league during which he played for just two teams, The Kansas City Chiefs and The Atlanta Falcons. He was selected for the Pro Bowl on 14 occasions and holds the league’s record for most receiving yards by a tight end. Gonzalez retired in 2013 and has since become a sports analyst. Find out more about the gorgeous lady behind this man here. 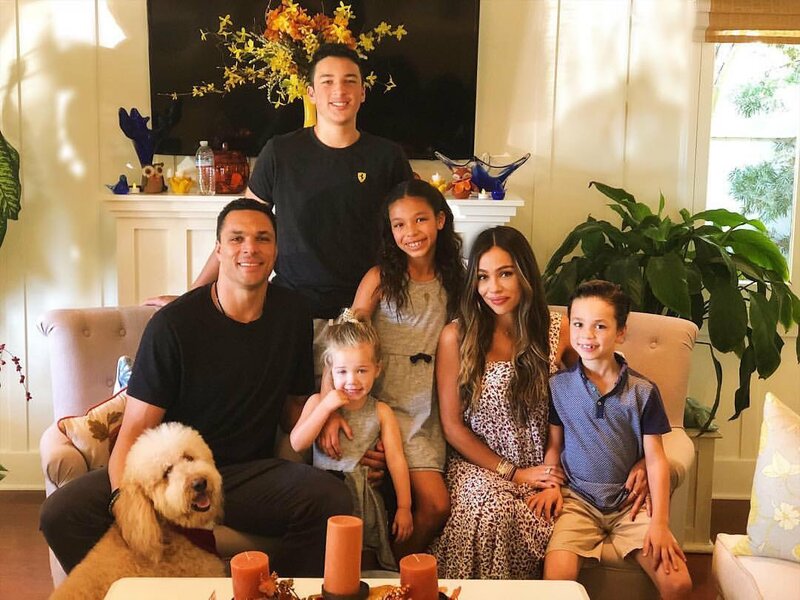 Who Is October Gonzalez – Tony Gonzalez’s Wife? Just as her name suggests, October Gonzalez was indeed born in the month of October, specifically the 10th of October 1980. Her full name at birth is October Calinda Vegas-Russell. The young Gonzalez grew up in L.A. California. She completed her high school education at West Brook Senior High School in Florida. When she graduated, she proceeded to the University of Texas at Austin where she reportedly got a degree in communications. Upon leaving college, October Gonzalez worked for some time as a bartender. She was later featured in the reality show, E! True Hollywood Story, which explored the lives of NFL wives. Gonzalez got her first major break in 2014 when she hosted a few episodes of The View. The View is a popular talk show with mostly women panelists. She gave a good account of herself and was rewarded with hosting duties on shows such as Rachael Ray (2016-2016) and Entertainment Tonight. October Gonzalez finally hit it big in 2017 when she was picked to co-host the Fox game show, Beat Shazam. The show is produced by award-winning actor, Jamie Foxx. Gonzalez served as the show’s co-host and in-house DJ. Asides from her hosting gigs, she has also appeared in a few documentaries like Playing it Forward and reality shows like Fablife. October Gonzalez’s net worth is still under review and is not yet available. However, it is safe to conclude that she must have raked in a decent sum from her career. Her husband, on the other hand, has a net worth of $20 million. He made his fortune from the hefty contracts and juicy endorsement deals he signed during his playing days. He is also a businessman and has been involved in several ventures since retirement. They include Extreme Clean 88 (a cleaning service based in Kansas City) and All-Pro Science (a sports nutrition company). Gonzalez and her husband have a heart of gold as they support several charities. As aforementioned, October Gonzalez is married to former NFL tight end, Tony Gonzalez. Their love story is worth telling. They first met in 2002. At the time, October was working as a bartender and had no idea who Tony was. Tony was immediately attracted to her and asked her out. She, however, turned him down due to the fact that she was still in another relationship. Tony tried again when he heard that the relationship had ended. She said yes and they started dating. They dated for four years before tying the knot on July 20th, 2007. It must be stressed that what they did was a commitment ceremony and not a legally binding marriage. The duo, however, considers themselves husband and wife. The couple is blessed with two children, Malia and River. Another much-loved member of the family is Nikko. Nikko is Tony’s son from an earlier relationship with award-winning media personality, Lauren Sanchez. October Gonzalez hails from a family of seven. Her father’s name is Pat Vegas while her mother’s name is unknown. She has three sisters and a brother named PJ Vegas. Her dad, Pat, was a musician and belonged to a band known as Redbone. Her grandparents were also musicians. Gonzalez and her siblings were instilled with a love for music at an early age. It must be stated that it wasn’t all rosy for them. Her parents had drug problems, and she and her siblings had to relocate to Florida to live with their extended family.